Discover the Heart of England, and over 2,000 years of civilization in a land famed for its natural beauty and heritage. Shropshire, in the west of the region, is where England meets Wales. Home of Brother Cadfael and Ironbridge you will also find beautiful medieval towns with distinctive ‘black and white’ Tudor architecture that continues into Herefordshire. 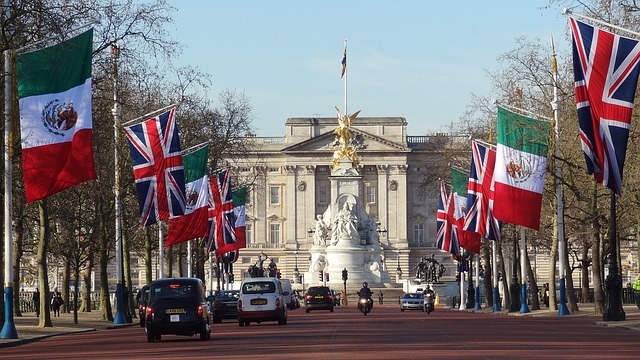 London’s traditional sights “Big Ben, Westminster Abbey, Buckingham Palace, St Paul’s Cathedral and the Tower of London” continue to draw in millions of tourists every year. Monuments from the capital’s more glorious past are everywhere to be seen, from medieval banqueting halls and the great churches of Sir Christopher Wren to the eclectic Victorian architecture of the triumphalist British Empire. There is also much enjoyment to be had from the city’s quiet Georgian squares, the narrow alleyways of the City of London, the riverside walks, and the quirks of what is still identifiably a collection of villages. And even London’s traffic pollution (one of its worst problems) is offset by surprisingly large expanses of greenery: Hyde Park, Green Park and St James’ Park are all within a few minutes walk of the West End, while, further afield, you can enjoy the more expansive parklands of Hampstead Heath and Richmond Park. If you’re looking to enjoy the finest shopping, history,culture, entertainment and leisure, there’s no better place than Southampton. It really is the jewel of the South. Ideally situated for exploring some of the most breathtaking coast and countryside in the south of England. Southampton is also host to some of the world’s most prestigious maritime events. Whether you are looking to get away for a few days or enjoy an action packed few hours, whether you’re eighteen or eighty-one Southampton is the place to be. A glance at the map gives some idea of the strategic maritime importance of SOUTHAMPTON, which stands on a triangular peninsula formed at the place where the rivers Itchen and Test flow into Southampton Water, an eight-mile inlet from the Solent. 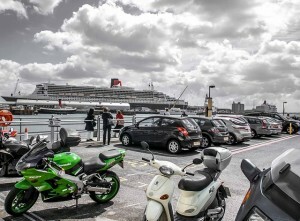 Sure enough, Southampton has figured in numerous stirring events: it witnessed the exodus of Henry V’s Agincourt-bound army, the Pilgrim Fathers’ departure in the Mayflower in 1620 and the maiden voyages of such ships as the Queen Mary and the Titanic. Core of the modern town is the Civic Centre, a short walk east of the train station. Its clock tower is the most distinctive feature of the skyline, and it houses an excellent art gallery that’s particularly strong on twentieth-century British artists such as Sutherland, Piper and Spencer (Tues-Sat 10am-5pm, Sun 1-4pm; free). The Western Esplanade, curving southward from the station, runs alongside the best remaining bits of the old city walls. Rebuilt after a French attack in 1338, they feature towers with evocatively chilly names “Windwhistle, Catchcold and God’s House Tower” the last of these, at the southern end of the old town in Winkle Street, houses a Museum of Archaeology, though lack of funding has meant that this is currently indefinitely closed except to groups by prior arrangement (tel 023/8063 5904). Best preserved of the city’s seven gates is Bargate, at the opposite end of the old town, at the head of the High Street; an elaborate structure, cluttered with lions, classical figures and machicolations (defensive apertures through which missiles could be dropped), it was formerly the guildhall and court house. Situated in North Western Europe, Ireland is an island of approximately 85,000 square kilometres (32,000 sq miles) and has a coastline that stretches over 4800km (3,000 miles) with several indentations and magnificent peninsulas. The island of Ireland consists of 32 counties, of which six are part of the United Kingdom. These 6 counties form Northern Ireland an entity created within the United Kingdom when the remaining 26 counties gained independence in 1922 to form what is today called the Republic of Ireland.. The 32 counties are grouped into 4 provinces, Munster, Connaught, Ulster and Leinster. Ulster, which consists of 9 counties, includes the six counties of Northern ireland. The Capital City of the Republic of Ireland is Dublin while Belfast is the seat of power in Northern Ireland. 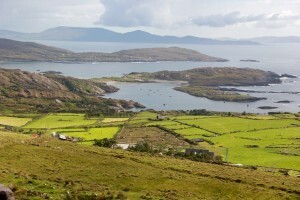 The largest county on the island of Ireland is Cork, situated on the South Western coast. For decades Ireland, as a tourist destination, has been renowned for its idyllic countryside, rugged coastline and rural traditions, for Irish music, literature, language and Irish culture, from legends & leprechauns to ancient monuments & Irish castles. What makes Ireland so special is its evocative scenery; the landscapes that have spawned the legends of Fionn Mac Cumhail, Cu Chulainn, Diarmuid & Grainne and the legendary warmth and friendliness of the Irish people. Dublin was voted Europe’s fourth most popular city break destination, behind London, Paris and Rome and is one of the friendliest capital cities in the world. 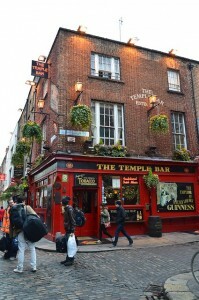 Dublin’s elegant Georgian architecture makes it one of Europe’s most attractive capitals. Dublin is a relatively small and accessible city, small enough and safe enough to get around on foot, while the Luas tram system and the suburban rail system, the DART, provide excellent transport links throughout the city. Dublin is where you’ll find many of the nations treasures, housed in the city’s galleries and museums and is where some of the most important events of Ireland were played out, most notably the Easter Uprising of 1916. Though the battle between the IRA and British Forces caused extensive damage to the O’Connell Street area of Dublin, (the bullet holes can still be seen on the General Post Office) this was one of the formative events of the Irish Republic. St Patrick’s Street runs through the heart of the city. It offers a host of shopping opportunities and boasts some of Europe’s largest retail chains. Oliver Plunkett Street, which runs partly parallel to Patrick’s Street, bustles with smaller shops, life and color. Second-hand books, hand-made chocolates, an infinite array of surprises can be found in the alleyways and lanes around this central shopping district. Heading west, one comes to the English Market , the culinary heart of Cork, boasting a huge array of fresh local produce, and tantalizing international delicacies. Following St Patrick’s Street eastwards leads to the statue of Father Mathew , much respected founding father of the Irish Temperance Movement. Tucked off to the left, one finds the Cork Opera House , venue for national and international theater, opera, and concerts. The Crawford Art Gallery with its impressive collection to suit modern and traditional tastes is also to be found here. At the other end of St. Patrick’s Street lies Grand Parade. A visitor might wish to turn left here, past the cheerful greenery of Bishop Lucey Park, and view the impressive Nationalist Monument, or turn right to ramble along the Coal Quay, with its bustling Saturday open-air market, second-hand shops, and enjoy a pint or a coffee in the spacious, gracious Bodega. One block further west lies North Main Street, and the Cork Vision Centre: situated in the historic St Peter’s Church, it offers the visitor the opportunity to really get a feel for the city with a magnificent 1:500 scale model of the whole city. Scotland is a very small country. It is 274 miles (441 kilometers) long. The coastline is so jagged that it adds up to 2000 miles (3218 kilometers). At its widest point it is 154 miles (248 kilometers). At its narrowest it is only 25 miles (40 kilometers). Because of Scotlands narrowness and its deep inlets, it is never possible to get far away from the sea. Scotland occupies the northern third of the islands of Great Britain. The river Tweed and the Cheviot Hills form Scotland’s southern border with England. The Northwest Channel separates southwestern Scotland from Northern Ireland. The northwest coast faces the Atlantic Ocean. East faces the North Sea. The east coast faces the North Sea, which separates Scotland from the mainland of Europe. EDINBURGH is the jewel in Scotland’s crown. The jewel has many facets: classical architecture piled on hills, tree-filled valleys, sweeping Georgian crescents, medieval closes, graceful bridges soaring across chasms, green parks, sudden views of the sea from street corners. And the castle. That supreme castle, which looks so right that it might have grown out of the rock by some natural process. The centre has two distinct parts, divided by Princes Street Gardens, which run roughly eastâ€“west under the shadow of Castle Rock. To the north, the dignified, Grecian-style New Town was immaculately laid out during the Age of Reason, after the announcement of a plan to improve conditions in the city. The Old Town, on the other hand, with its tortuous alleys and tightly packed closes, is unrelentingly medieval, associated in popular imagination with the underworld lore of schizophrenic Deacon Brodie, inspiration for Stevenson’s Dr Jekyll and Mr Hyde, and the bodysnatchers Burke and Hare. Edinburgh earned its nickname of “Auld Reekie” for the smog and smell generated by the Old Town, which for centuries swam in sewage tipped out of the windows of cramped tenements. Set on the crag which sweeps down from the towering fairytale castle to the royal Palace of Holyroodhouse, the Old Town preserves all the key reminders of its role as a capital, plus a brand new parliament building rising up opposite the palace. A few hundred yards away a tantalizing glimpse of the wild beauty of Scotland’s scenery can be had immediately beyond the palace in Holyrood Park, an extensive area of open countryside dominated by Arthur’s Seat, the largest and most impressive of the volcanoes. In August and early September, around a million visitors flock to the city for the Edinburgh Festival, in fact a series of separate festivals that make up the largest arts extravaganza in the world. Among the many museums, the exciting new National Museum of Scotland houses ten thousand of Scotland’s most precious artefacts, while the National Gallery of Scotland and its offshoot, the Scottish National Gallery of Modern Art, have two of Britain’s finest collections of paintings. 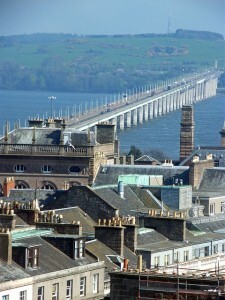 Dundee is a lively, friendly city in a dramatic location at the mouth of the River Tay on Scotland’s east coast. Life sciences research, the arts, business, education, hi-tech manufacturing, telecommunications and tourism are Dundee’s new found talents. Previously Dundee boasted a premier whaling port and was the centre of the world textile trade. Dundee serves up a unique quality of life with more hours of sunshine, the purest air quality and more green spaces than any other Scottish city. Even prior to its Victorian heyday, Dundee was a town of considerable importance. It was here in 1309 that Robert the Bruce was proclaimed the lawful King of Scots, and during the Reformation it earned itself a reputation for tolerance, sheltering leading figures such as John Knox. After destruction by the Jacobite Viscount Dundee, the city picked itself up in the 1800s, its train and harbour links making it a major centre for shipbuilding, whaling and the manufacture of jute. This, along with jam and journalism (the three Js which famously defined the city) has all but disappeared, with only local publishing giant D.C. Thomson, publisher of the timelessly popular Beano and Dandy comics, as well as a spread of other comics and newspapers, still playing a meaningful role in the city. Wales lies west of England and is separated from England by the Cambrian Mountains. It is bordered on the northwest, west, and south by the Irish Sea and on the northeast and east by England. Wales is generally hilly; the Snowdon range in the northern part culminates in Mount Snowdon (3,560 ft, 1,085 m), Wales’s highest peak. As to the rugged mountains of my country, well they form the spine of the land and as such are called the Cambrian Mountains. In ranging those 190 miles from the country of Gwynedd in the north to Glamorgan in the south, there are many prominent peaks which rise from within. None however, can be more so than Snowdon, for it is she that is the highest peak in Wales. With her attendant peaks she forms the Eyrie, the one time ‘Home of the Eagles’; from where one can see by looking north, the Island of Mon (Anglesey); the one time garden of Gwynedd, lying at their feet. In most heavily populated areas of Wales, such as the Southeast (containing the large urban centers of Cardiff, Newport and Swansea), the normal language of everyday life is English, but there are other areas, notably in the Western and Northern regions, (Gwynedd and Dyfed particularly) where the Welsh language remains strong and highly visible. 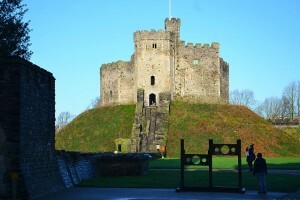 Cardiff is the largest city in Wales and became the capital city of Wales in 1955. It is a stylish town which has gained in confidence since the recent establishment of the Welsh Assembly (devolved power for Wales) in the regenerated Cardiff Bay. It also has the best shopping in Wales: pedestrianised Queen Street is the centre, but the Victorian arcades which branch off St. Mary Street are more fascinating. The new St. David’s Centre has just opened with its huge central gallery, and its incredible John Lewis store is probably the best department store you will find outside London. The National Museum and Gallery is a bit of a jewel. A vast collection in a beautiful building, it effectively manages to combine exhibits of both art and science. The “Evolution of Wales” gallery is permanently on display and charts Wales over 4,600 million years using robotics and audio-visual effects (too many rocks, but good dinosaurs). Free admission. The city skyline is dominated by the Millennium Stadium. One of the best sports stadiums in Britain was built for the 1999 Rugby World Cup. It has a retractable roof which proves handy for keeping the merciless Welsh sun off the athletes and spectators. It is possible to take a stadium tour. If you don’t want to leave your computer, try the 360° virtual tour. Swansea is Wales’s “City by the Sea” – the second-largest city in Wales is situated right on the broad sweep of sand that is Swansea Bay (the beach is within easy walking distance of the city centre). Once a large, industrial port, the city has been cleaned-up and is now making the most of its maritime heritage. The old South Dock has been converted into a posh, architecturally interesting marina. 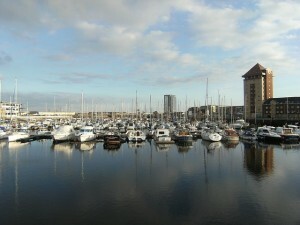 The marina is now dominated by the 107m Meridian Quay Tower – the tallest building in Wales. Have a meal at the penthouse restaurant with amazing views (Tel. 01792 301155 for reservations). The £30m National Waterfront Museum has just opened, telling the story of Wales’s industrial and maritime heritage. It’s an impressive glass and steel modern buiding on the waterfront – and it’s free to get in. The impressive, new £32m Leisure Centre (LC) has just opened. It has a fantastic leisure pool, real state-of-the-art (I know – I’ve tried it) with all the latest slides including the “Masterblaster” – a long roller-coaster ride which blasts riders uphill on jetted water. It’s ideal for the kids on a wet day. It also has the “Surf Rider”, the only artificial surfing ride in the UK. I tried it – it’s blinking difficult! Swansea’s most famous son is the poet Dylan Thomas, and you can follow his life from his childhood in Swansea to his death in New York in the permanent exhibition at the Dylan Thomas Centre. There you will find unique archive material, original sound recordings (from famous works such as “Under Milk Wood”), and a “spelling wall” with magnetic words taken from Dylan’s poems. Free admission. The UK unit of currency is the pound sterling (£). In London we often call one pound (£1) a “quid” and sometimes a “nicker”. Northern Ireland still uses pounds sterling, while southern Ireland has moved to Euros. Northern Irish pounds ARE legal tender in England but you will rarely see them. Scottish notes and coins ARE legal tender in England, but some shopkeepers may not be keen to accept them as they don’t recognize them. You won’t have problems at the tourist attractions in central London, but if you go further afield you may not be able to spend them. National passports and identity cards are acceptable documents for EU and EEA citizens and national passports and visas are acceptable documents for non-European nationals.